It was Arthur Spiderwick who started it. He wrote a Field Guide to the Fantastical World Around You. And it was Jared Grace who found his Great-Great-Uncle Arthur's ancient cloth-wrapped book. 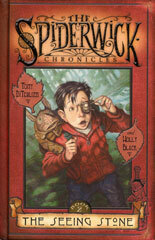 Inside it were details of all the strange and startling faerie creatures that Arthur Spiderwick had ever encountered. "Goblins in the wood. Doesn't look good. My warning comes too late. There's no help for your fate." Jared can't see his enemy. He needs help, and where else would he look but the Guide? Simon was stuffed in a cage much too small for him. His legs were drawn up against his chest, and the toes of one foot stuck through the bars. His bare skin was scraped from the thorns that lined the cage.